The STA module is a tunnel current sensor for the Prober Shuttle nanoprobing system. It enhances the Advanced Probing Tools by providing a simple, accelerated and secure method for approaching the surface of conductive samples. Additional details can be found in the STA brochure and on the Safe Tip Approch product page. 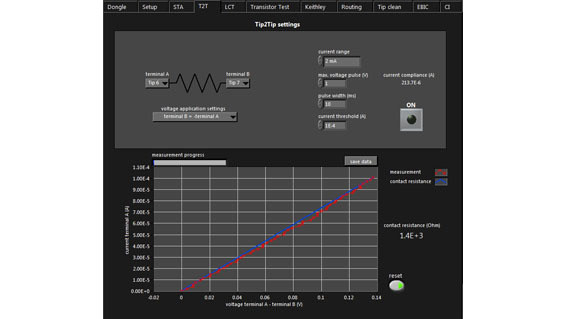 The Tip2Tip Tester is used to measure resistance between two tips. This function can be used to quickly determine a line resistance or to simply check that two tips have low resistance when brought into direct contact thus confirming that they are free of contamination. Additional details can be found in the LCT brochure. 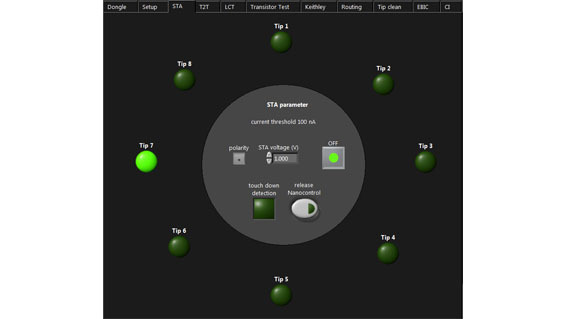 The Live Contact Tester Module is the heart of the Advanced Probing Tools. It provides visual feedback on each tip’s contact to the substrate by simultaneously sweeping a voltage on up to eight tips at up to ten sweeps per second. This functionality is especially important since the contacts can be covered by a thin, non-conductive contamination layer that is invisible to the SEM. Thus, while it is easy to visually confirm that the tip is in physical contact with the sample, without the LCT, it is very difficult to know if all tips are in electrical contact with the sample, as well. 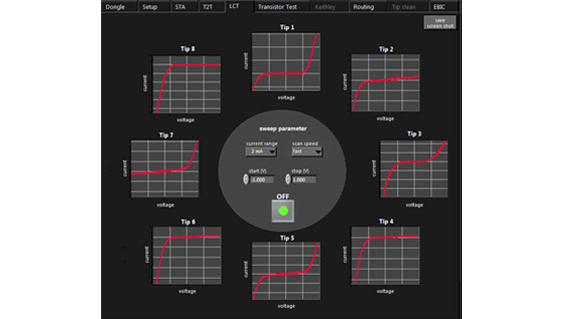 The Transistor Test Module provides the user with a tool to perform fast acquisition of transistor characterisation curves - it can record up to ten arrays of curves per second. 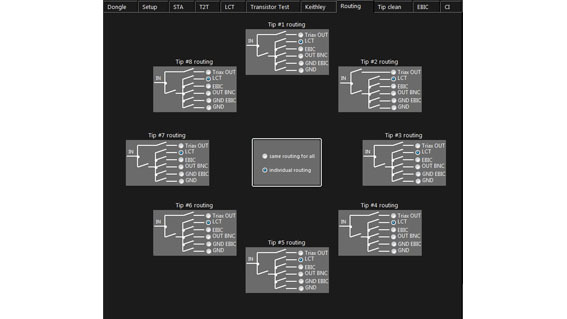 This real time response helps the operator tweak the tips' positions in order to optimise contact. 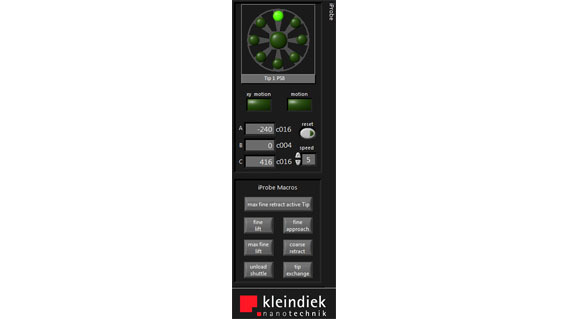 The Keithley Remote Module provides remote access to the Keithley 4200 SCS without having to leave the APT environment. Measurement recipes can be stored and recalled, measurement results are displayed on the screen and stored for later evaluation. Additional details can be found in the Keithley Remote brochure. Each probe tip is fitted with a dedicated, double shielded signal line and vacuum feedthrough. These leads need to be connected to the various measurement devices. 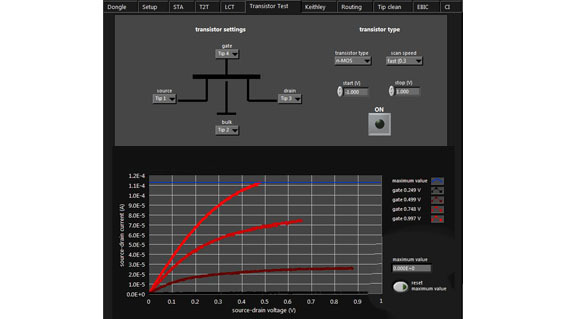 The Routing Module switches the signal leads to the desired measurement device or output. The probe tips can accumulate contamination layers that prevent electrical contact to the sample. One method for cleaning the tips in situ is to perform a burn-in. This entails carefully driving current through two crossed tips in order to heat them and evaporate any contaminants. Additional details can be found in the Tip Cleaning Module brochure. 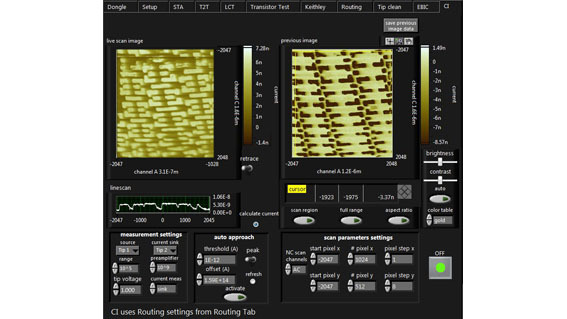 EBAC, RCI, EBIV, EBIRCH and EBIC measurements are used to visualise current paths or p-n-junctions buried under the sample surface. These techniques rely on precisely measuring the current flow resulting from the SEM's beam interacting with the sample while using one or more probe tips to record currents. The recorded signals are amplified and fed back to the microscope thus generating a greyscale map of current in the scanned area. 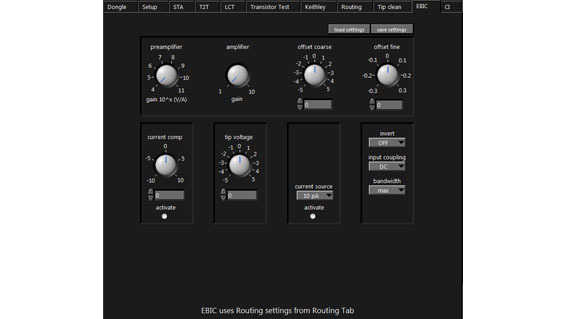 The APT's EBIC module provides software access to all of the amplifier's settings. Additional details can be found in the EBIC brochure and on the EBIC application page. 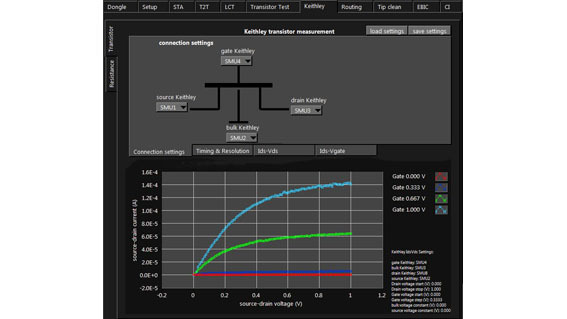 Complimentary to EBIC, Current Imaging can be used to localise faults in semiconductor samples. The image is produced by gently sweeping a biased probe tip across a surface and measuring the current response at each point in the sweep, thereby generating a map of the current (either to bulk or to a second, stationary probe tip). The region scanned with CI is also cleaned by the tips' gentle brushing action, thus removing contaminants. Additional details can be found in the Current Imaging brochure and on the Current Imaging application page. 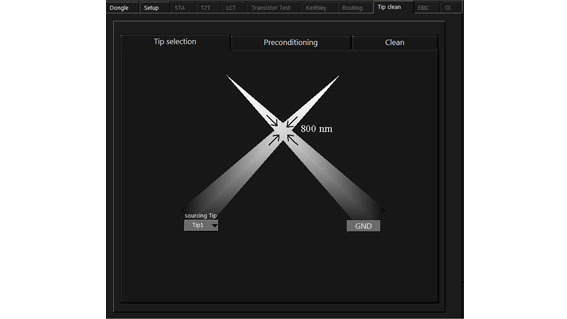 Rewritten from the ground up and fully integrated into APT, the iProbe software provides the most flexible and intuitive way to control up to twelve micromanipulators through six orders of magnitude. It allows three-dimensional control via two-handed operation - your mouse for X and Y movements and a jog dial for Z movements. 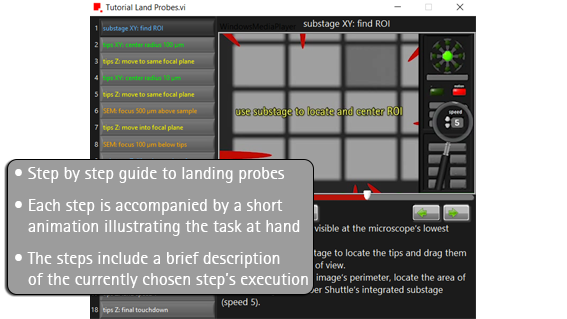 The APT Assistant is your guide to quickly and safely landing probe tips on the sample surface. It provides step by step instructions as well as short video animations for each action to assist the operator in obtaining the required results.